Showing the world just how charming rats are! We will not be producing a calendar for 2017. My apologies to all of our regular customers. 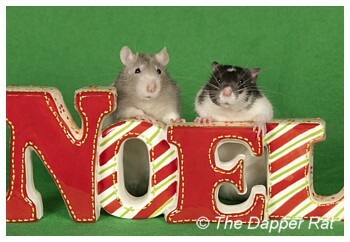 Season's Greetings from The Dapper Rat! season and a happy, healthy and exciting 2017! with appreciative comments for our website or with orders from our store. and our giant furry cat, Beaumont. Looking for something special as a gift for your rats or a rat loving friend? Greeting cards - for all occasions. Bookmarks, magnets and posters from our Flat Dapper Rat range. Within Australia: 1-5 days. NZ: 4-5 days. USA/Canada: 7-10 days. UK/Europe: 8-10 days. Are your rats as happy and comfortable as Scrambler and Grub? Every rat needs a hammock! Somewhere comfortable and safe to snooze. A dark place to hide away from bright daylight. A warm and cosy place to bundle up with friends. Or a private haven to be alone for awhile. Much loved by The Dapper Rats for over 12 years. Emails: I answer all email orders within 24 hours on business days. So if you haven't heard back from me, please check your spam folder for my reply, or contact me again in case your email hasn't reached me. I'm sorry I've been unable to answer rat questions on email lately. With two young kids and running my business I simply don't have the spare time to answer all of the emails I receive each day. If you have a rat question, contact ratinfo (for general rat care questions) or rathelp (for urgent rat medical questions). Or consider joining the ratlist where you can chat with other rat owners and ask as many questions as you like. Meet our charming rats, both present and past. See their adorable photos and read about their unique personalities and antics. 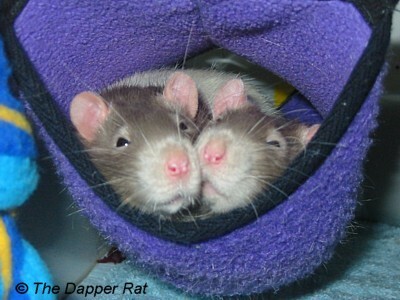 Lots more photos of our rats being cute, cheeky, troublesome and even dignified. Also the Funny Photos Collection and The Gallery of Yawns. And tips for rat photography! Our home-made ratty mansion and tips for building your own cage. desktop themes and other fun rat stuff. A collection of articles on rat care, helpful tips, and general rat information. Debbie Ducommun's "Rat Health Care" booklet, Wodent Wheels, and rat toys! Our favourite rat links. Categorised for easy access to everything rat related. Includes a list of Rat Friendly Australian vets! Find out a little about who we are and how we ended up sharing our lives with rats. A selection of photos from my 1997 research expedition. Want to link to The Dapper Rat? 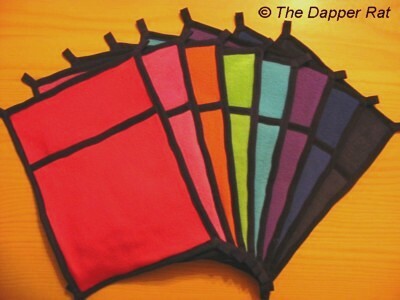 If you enjoy The Dapper Rat website and wish to support us, please consider purchasing something from our Rat Products page. Copyright © The Dapper Rat, 2000-2012. All rights reserved. Please request permission if you wish to use any images or content on this website.